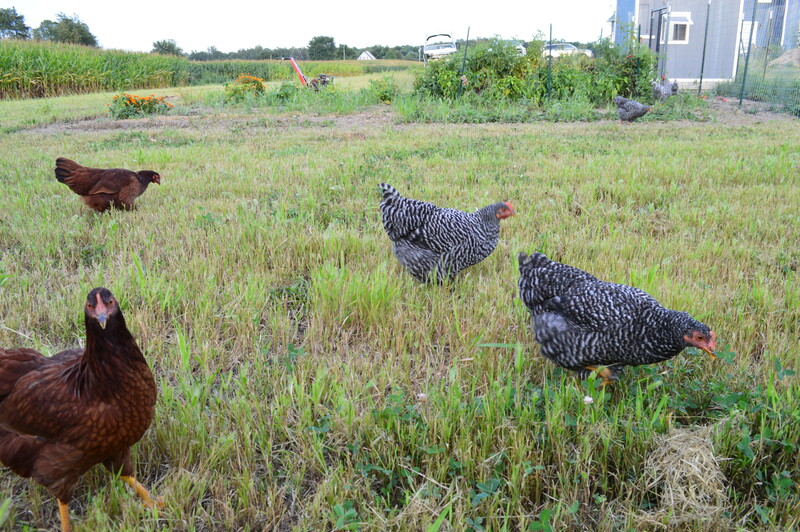 This past fall, Adam and I raised fifty free range chickens for their meat, in addition to the egg laying hens. If you knew me any time before 2011, go ahead and say it. I know your thinking it. Trust me. I thought it plenty of times too. What the hell am I doing with over fifty chickens in my backyard? The only “chicken” in my backyard growing up was when we would play it in the pool. Things that were in the backyard of my youth? A Jack Nicholas golf course and a large swing set… that was painted one of three colors permitted by the Home Owners Association. I never looked into it, but chickens probably didn’t make that “permitted” list. As insane as it does seem, it’s my reality. And, now with a freezer full of great, pasture raised chickens it all makes sense and it’s all worth it. Don’t worry, friends… I have not totally converted. We took the birds somewhere else to get processed. They took care of everything, so our birds look just like a whole chicken I would get at the grocery store. Phew. Adam and I have been experimenting with all sorts of recipes with these birds. 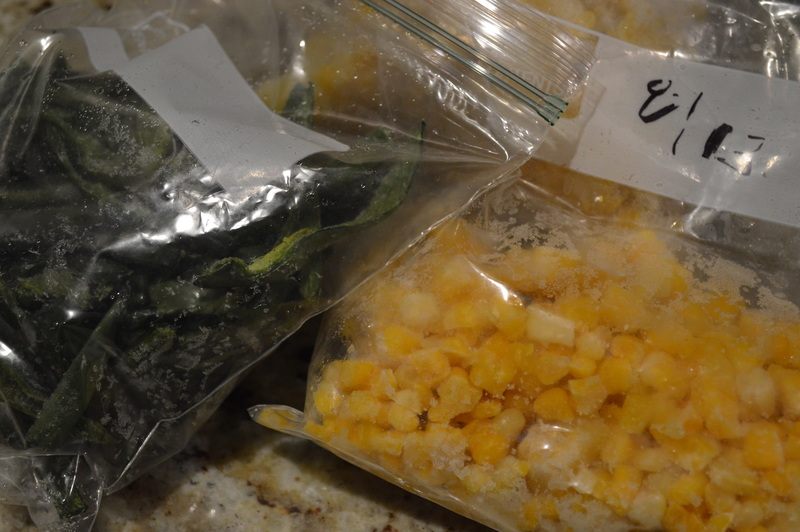 This week, using one bird, we made two great and very different meals. Note: I now understand why magazines, like Real Simple, walk readers through tips like these with illustrations. Photos of raw meat just don’t look that pretty. But, today, I am scraping vanity because I do think it helps seeing how it really works. 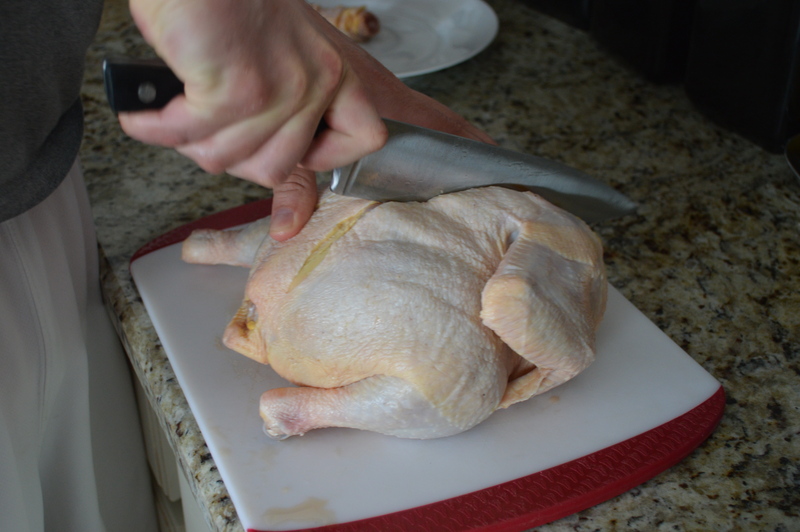 Put the chicken breast on a cutting board breast side down with the neck pointing away from you. 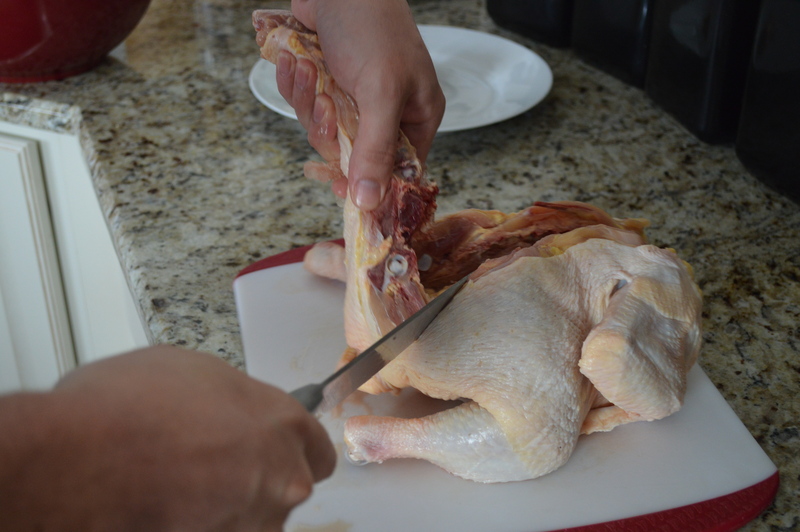 First, starting from the front of the chicken, insert the knife and work it from the neck to the tail of the bird, cutting right along one side of the backbone. It is important to cut as close to the bone as you can. Make the same cut on the other side of the back bone and remove the spine. 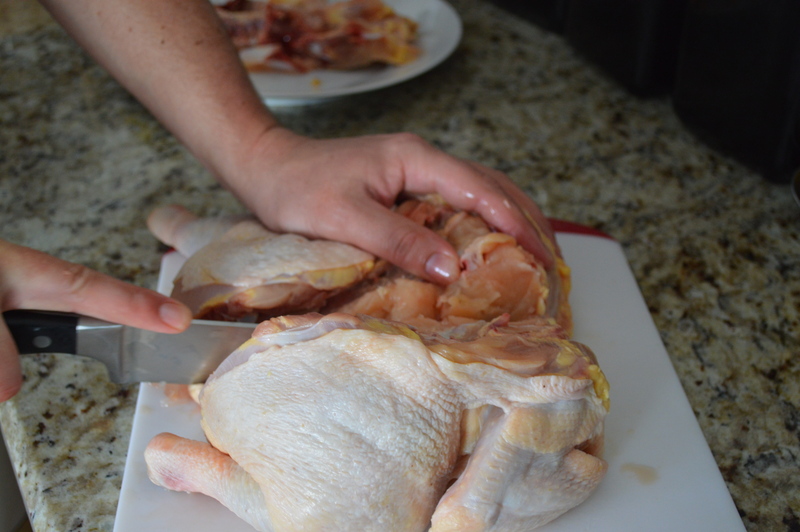 Keep the chicken breast side down and make a small slice in the skin and cartilige by the neck. 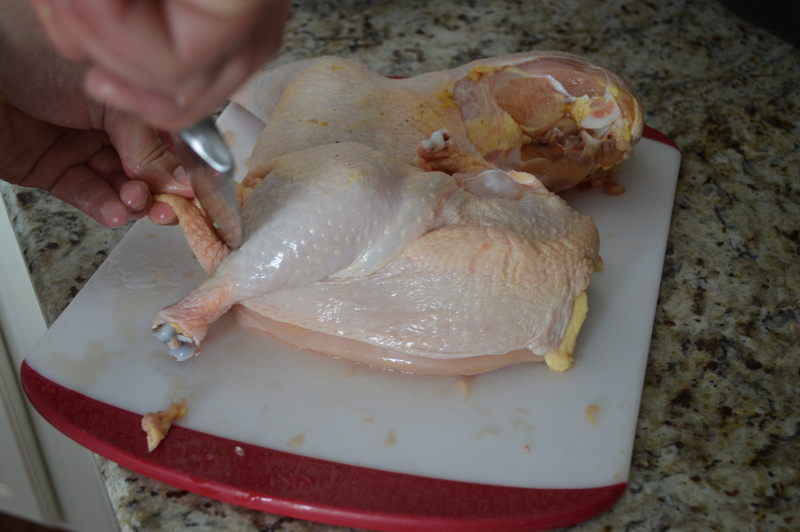 Fold the chicken back and forth in order to snap the breastbone. Remove the “Keel” bone. This is the bone located inbetween the rib bones. 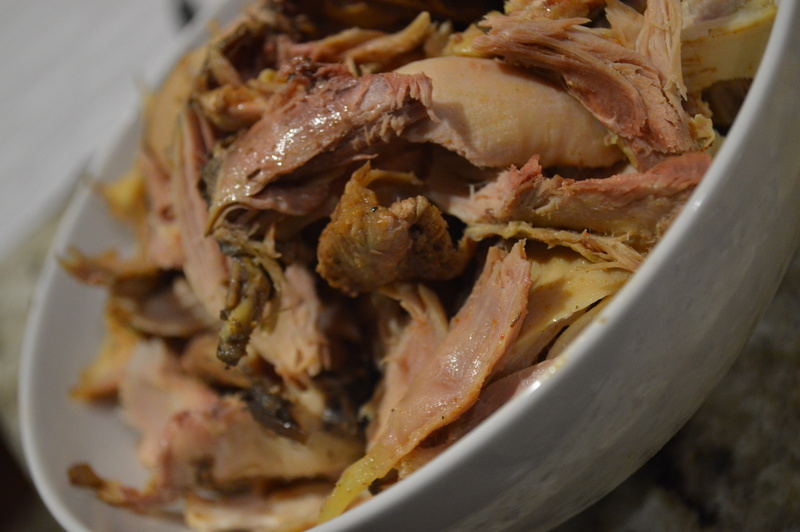 Cut off any cartilige on the breastbone. 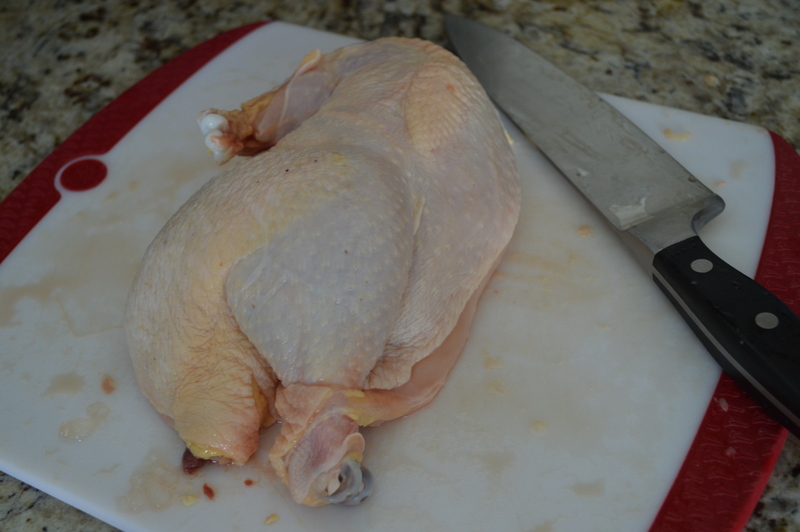 Once removed, cut the bird in two down the middle of the breast. Make a small slice in the skin to tuck in the leg. 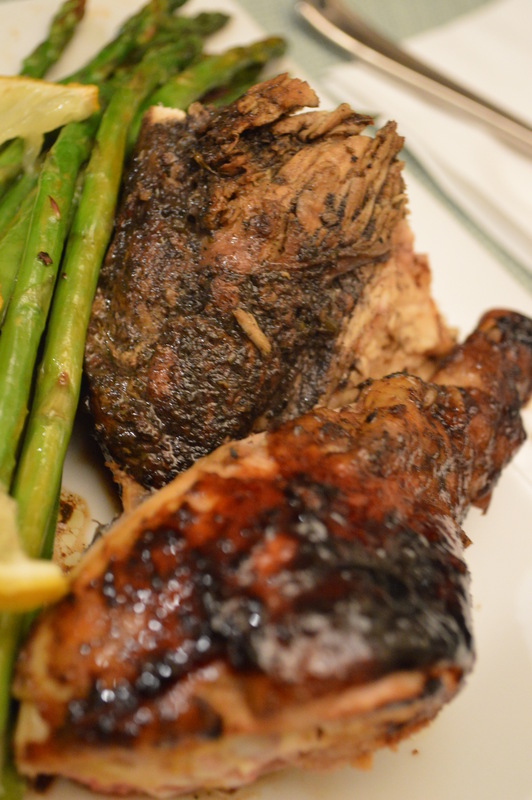 With the first chicken half, we made Jerk Chicken. 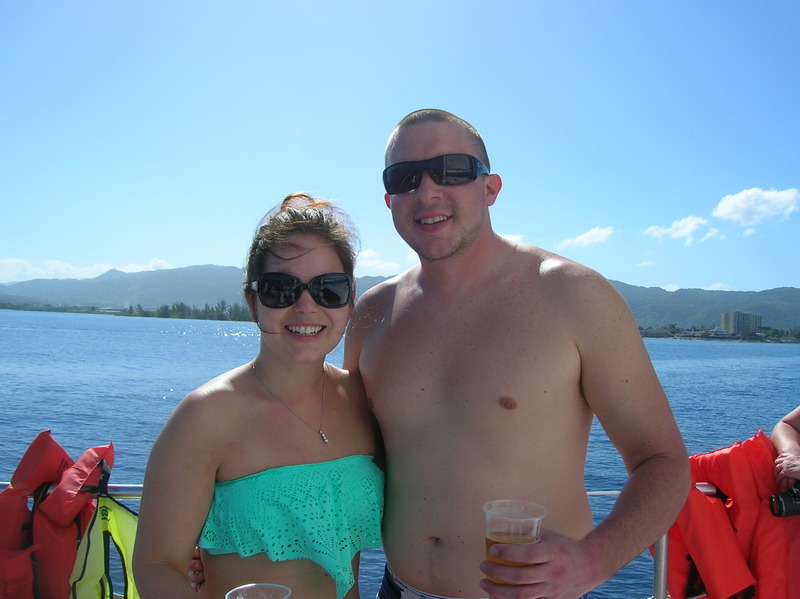 We were in Jamaica the last week of Janaury and were welcomed back to the midwest by major snow storms and bitter cold. 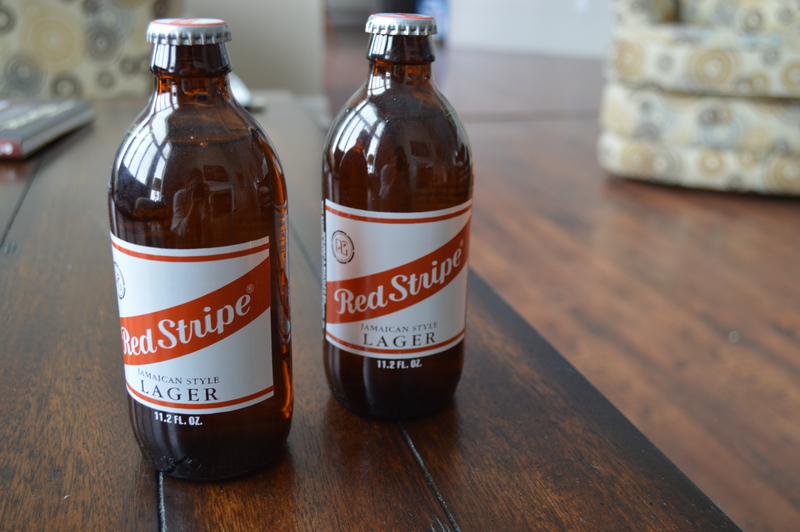 So, a couple nights ago, I picked up a six pack of Red Stripes and decided to make the quintessential Jamaican entrée. My goal was to pretend like we were on the island, but once I put the chicken in the skillet, I didn’t have to pretend. My whole kitchen smelled like Jamaica. Yah, mon! 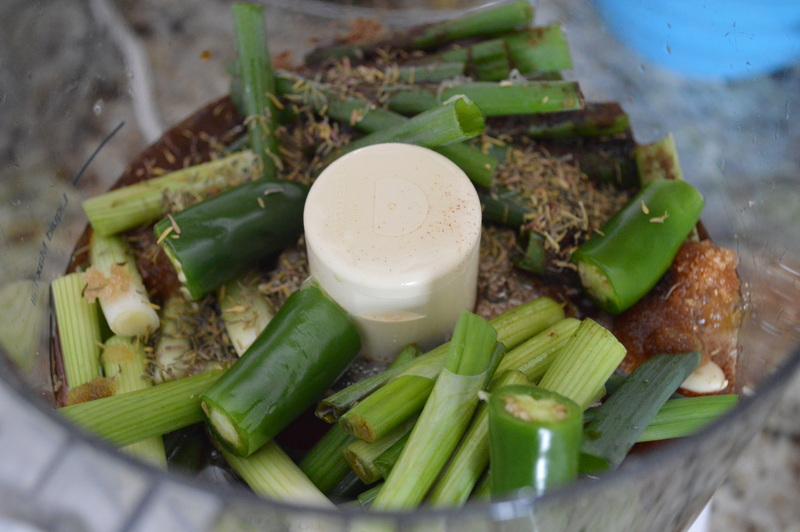 In a food processor, puree peppers, scallions, garlic, thyme, brown sugar, allspice, soy sauce, lime juice and oil. 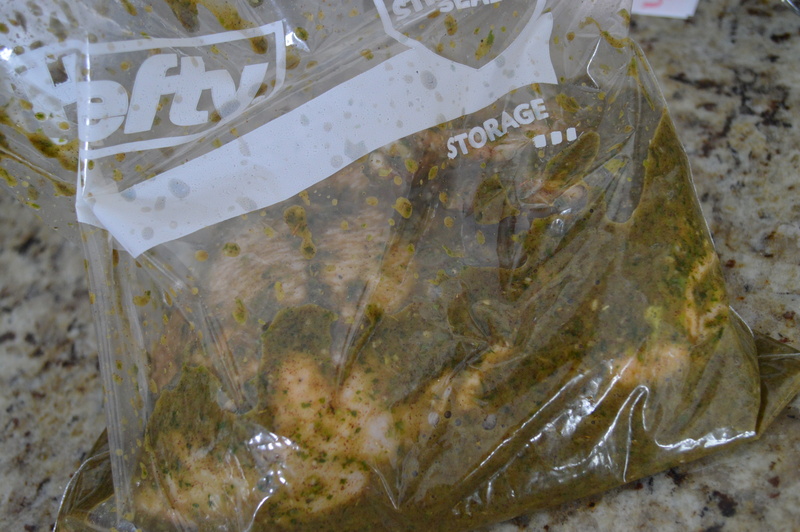 Put mixture into a large zip lock bag with the chicken pieces. Let marinate in the refridgerator for at least one hour or up to twenty four hours. 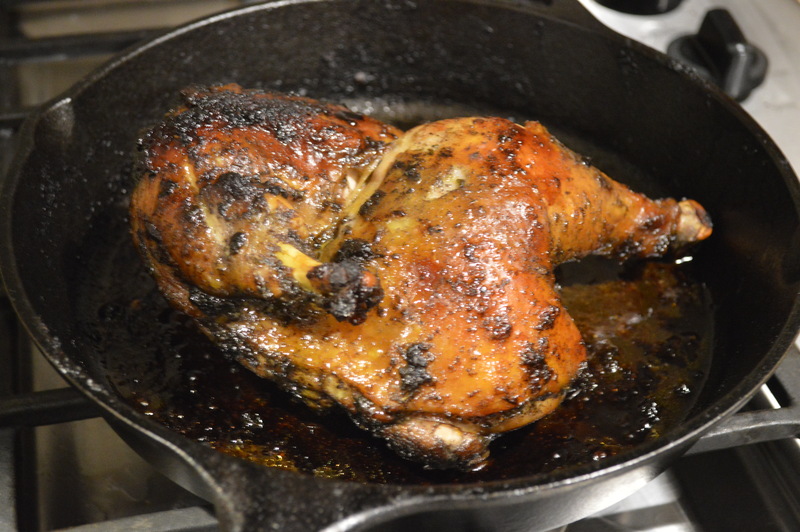 Grill until cooked through or sear on the stove in a skillet that can go in the oven and move into the oven for thiry minutes, until the chicken is cooked through. Use oil or spray to prevent sticking before cooking. If your going to have Jerk Chicken, you’ve gotta have some Red Stripe’s to wash it down! And with the other half of the bird I made a soup using some of our frozen garden vegetables. 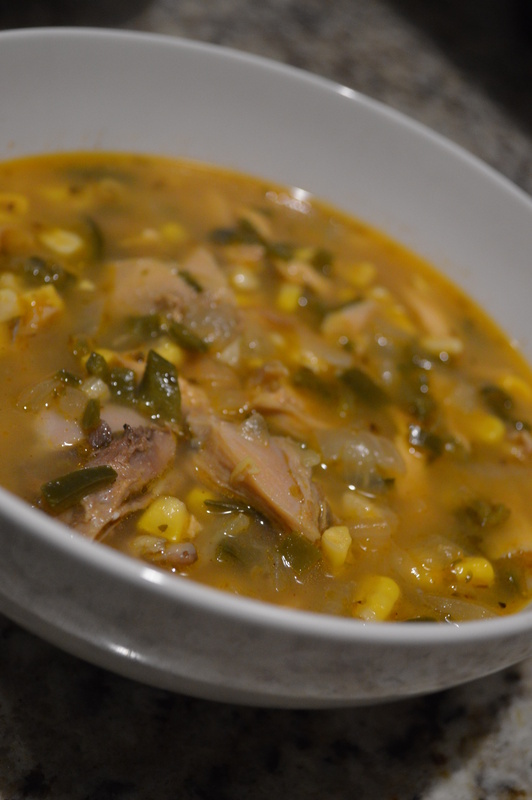 This super simple, spicy soup was easy to make and, excluding the spices, came straight from the backyard! 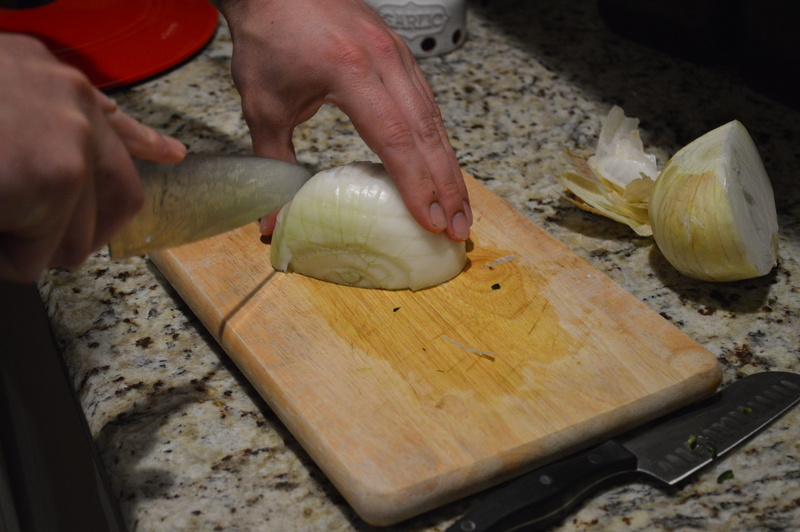 In a large pot, saute olive oil and onions over medium heat about 5-8 minutes. Add the spices and garlic and saute for a minute. 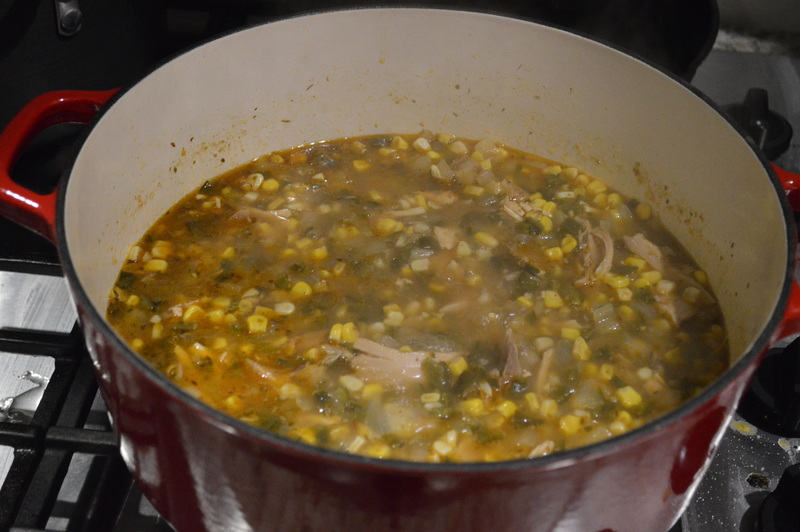 Add chicken broth, shredded chicken, corn and poblanos and bring mixture to a boil. Reduce the heat to a simmer and let cook for thirty minutes. Cage Free– Term established by the USDA meaning the chickens have been raised without cages. They can walk around and flap their wings. But, don’t be fooled: This doesn’t necessarily mean that they have access to the outdoors. They can be “cage-free” in a barn and never see the light of day. 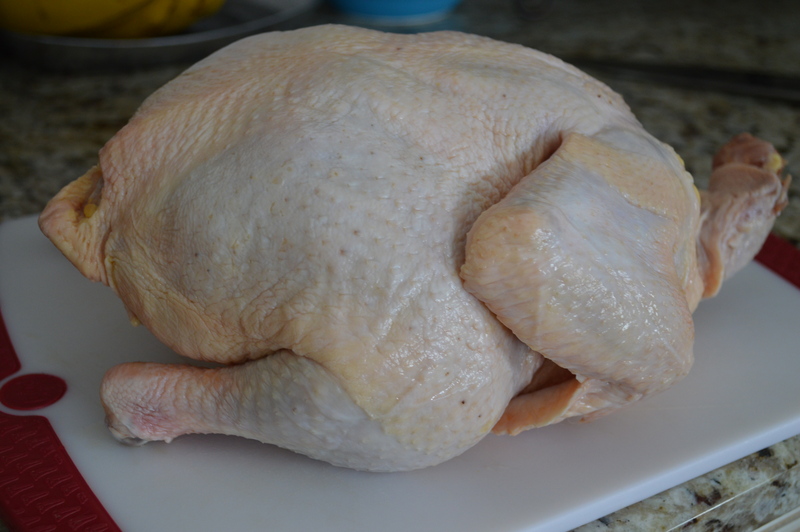 Free Range– Term established by the USDA. Means the birds are cage free, with access to the outdoors but there are no regulations on how long they are outside, the conditions of the outdoors, or what the chickens eat. Pasture Raised– This is not a term regulated by the USDA. It means the chickens feed in a pasture and eat a diet of bugs and grasses in addition to feed. It might also means that the hens are possibly fenced in or kept in a pen. Natural– Sounds nice… but this really doesn’t mean anything. 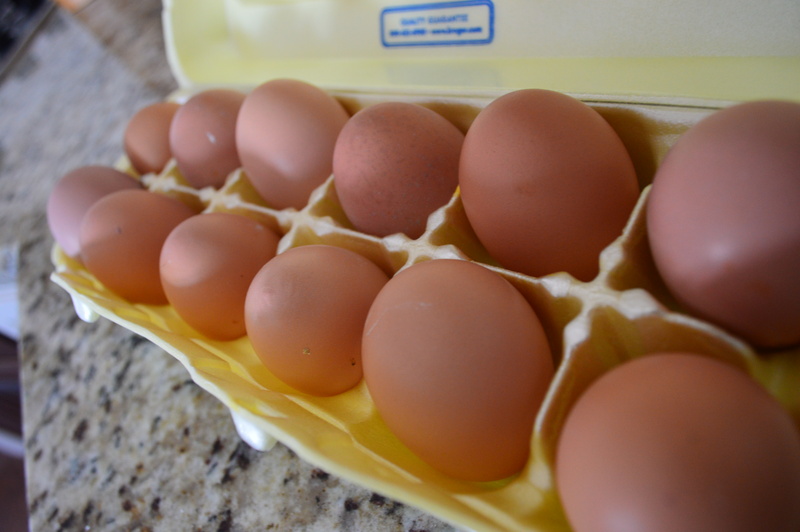 All chickens and eggs are natural because they are not a processed food. There are no regulations surrounding this term. Organic– This is regulated by the USDA and means that the chickens were fed feed that had no contact with pesticides and fertilizers. There are no regulations for the conditions the hens live in. Keep in mind that all egg laying chickens are hormone free. This is based on a USDA regulation. They are given antibiotics if they are ill, but that is all that is permitted. 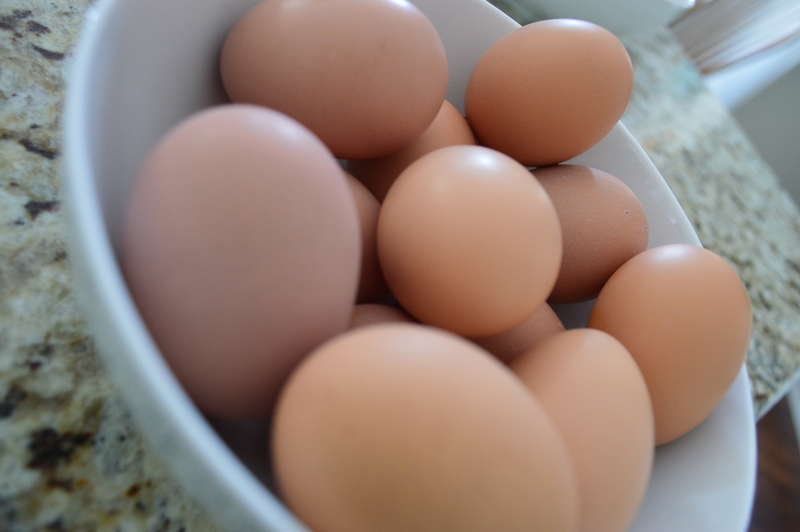 The eggs from our backyard hens are, by definition, Pasture Range and Organic. They have their coop, but we let them roam throughout the yard everyday. They have feed in the coop but also eat grass and bugs. Exploring the yard last September. We have five hens and get about four eggs each day. 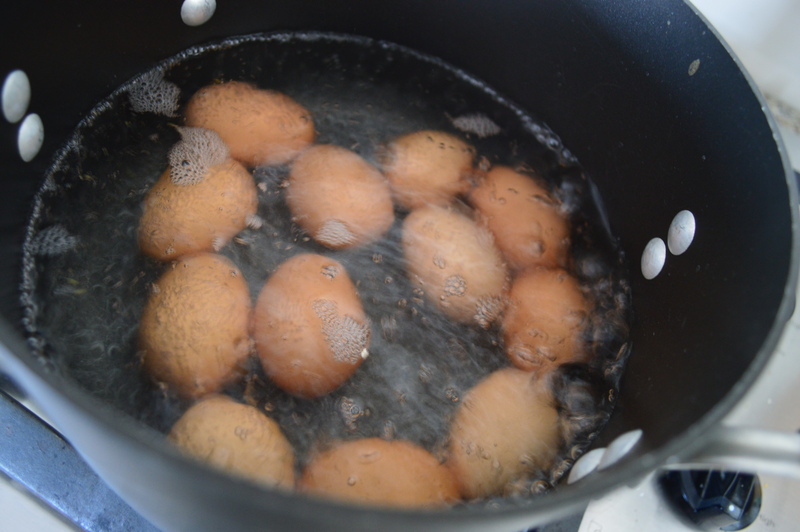 I have gotten in the habit of hard boiling ten to twelve eggs each week. They are so great to have in the fridge for a quick snack or an on-the-go breakfast. 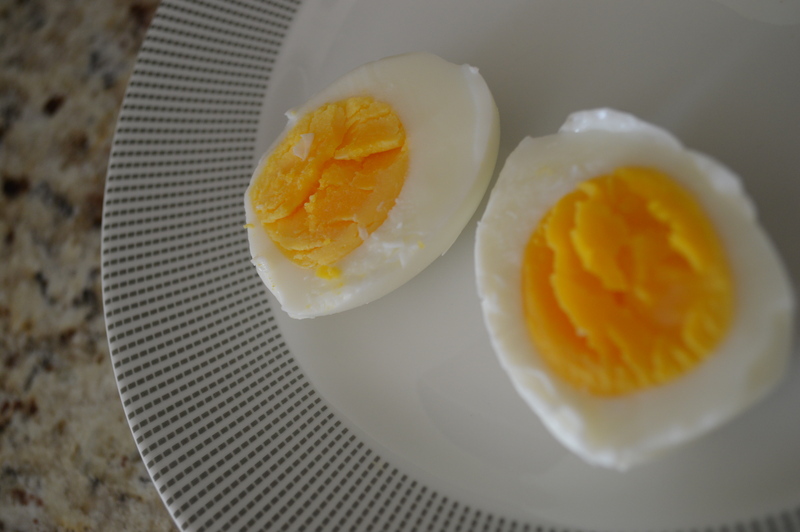 There is a little bit of a fine science when it comes to hard boiling eggs. If they don’t boil long enough the yolks are runny. If they boil too long the yolks turn green. 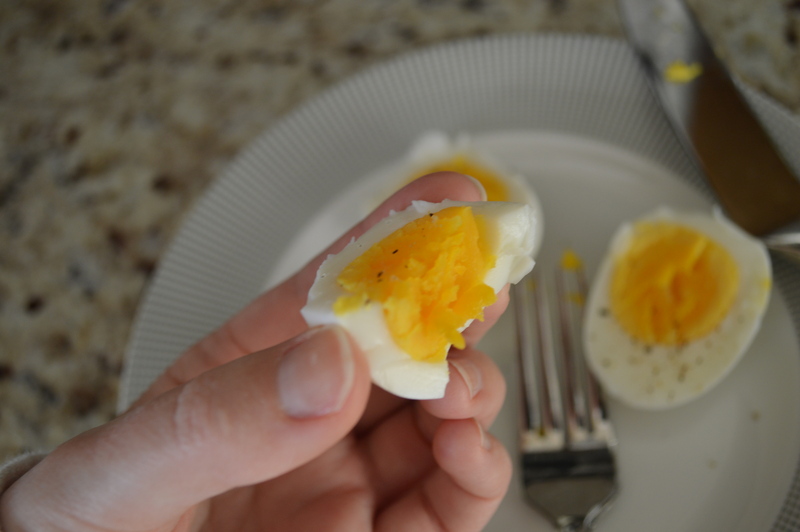 And it may seem super basic, hard boiled eggs… easy, right? 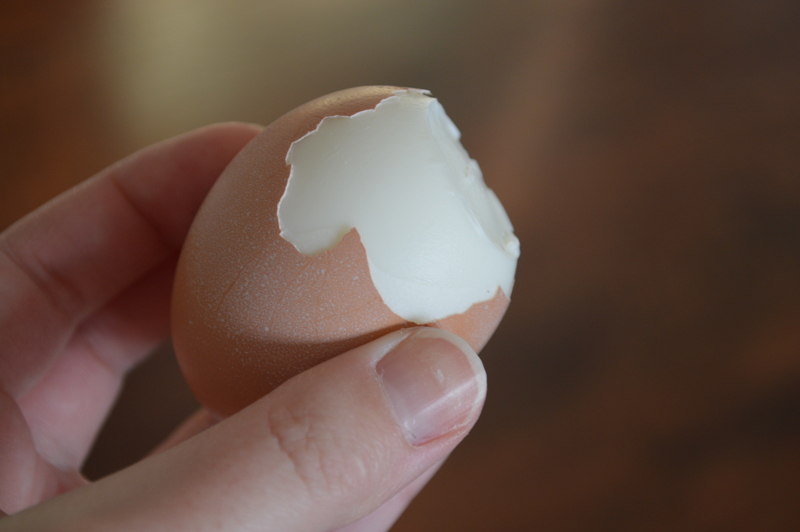 But, many of my friends have admitted to not knowing where to begin when making hard boiled eggs. I even had to Google it when I lived in my first apartment. Thanks to a lot of practice, I think I finally have it down. I used a dozen eggs we had stocked up in the fridge. Place eggs in the bottom of a sauce pan. Cover with about one inch of water and bring to a boil. 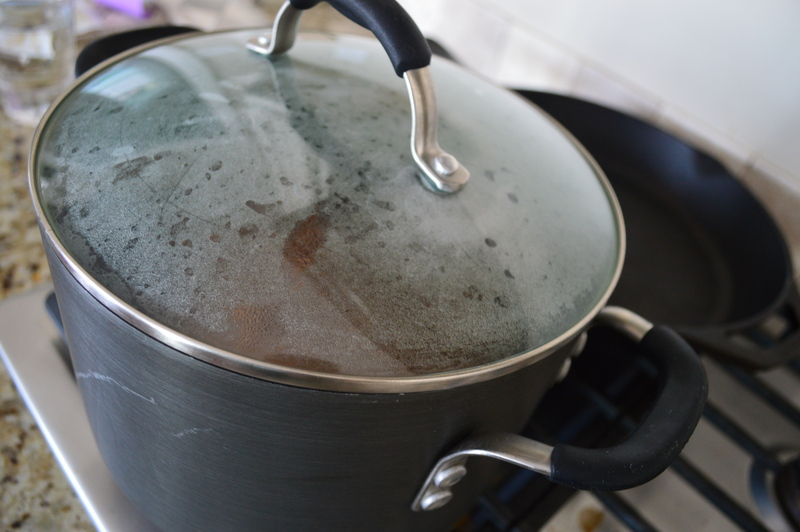 Once boiling, remove from heat, place lid on pan. Let sit for twelve minutes. 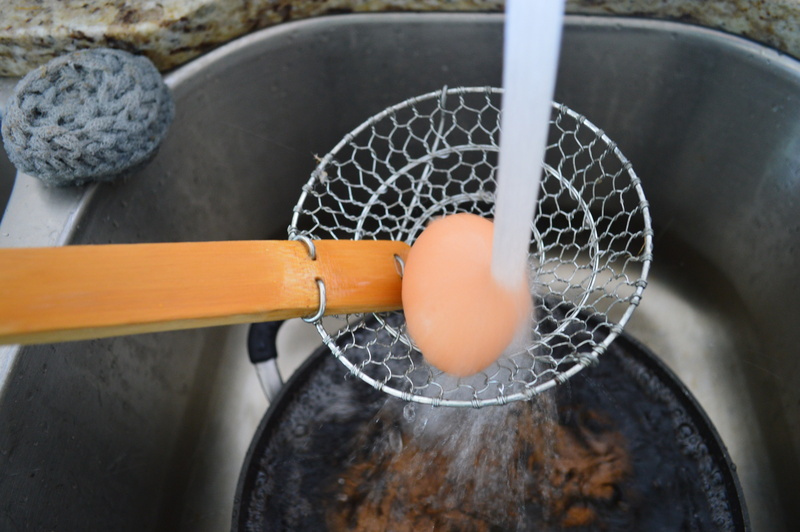 Run eggs under cold water. Enjoy right away or place in the fridge. They last about a week in their shells… but ours never make it that long! Local Food in the City. This weekend I left my provincial life in the country for champagne, yachts, stilettos and… um… drag queens. It was my “Little Sister” from the sorority, Lauren’s, bachelorette party in Chicago. It was a fabulous time. 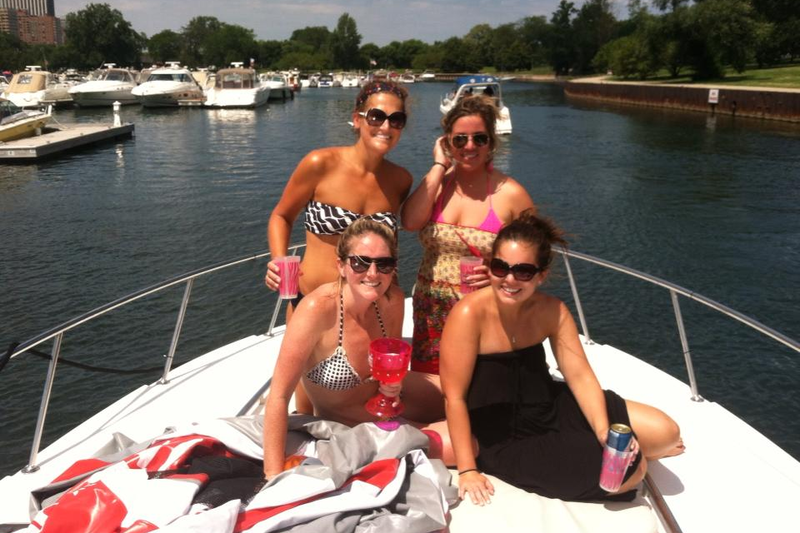 A few of us took Friday off and spent the day on a boat on Lake Michigan. It was so relaxing and the view of the city from the water was outstanding. We spent Saturday shopping, catching up and then hit the town in the evening. Dinner was at a delicious Tequila Bar and followed by a very entertaining drag show. Babes on a boat for the Bachelorette! 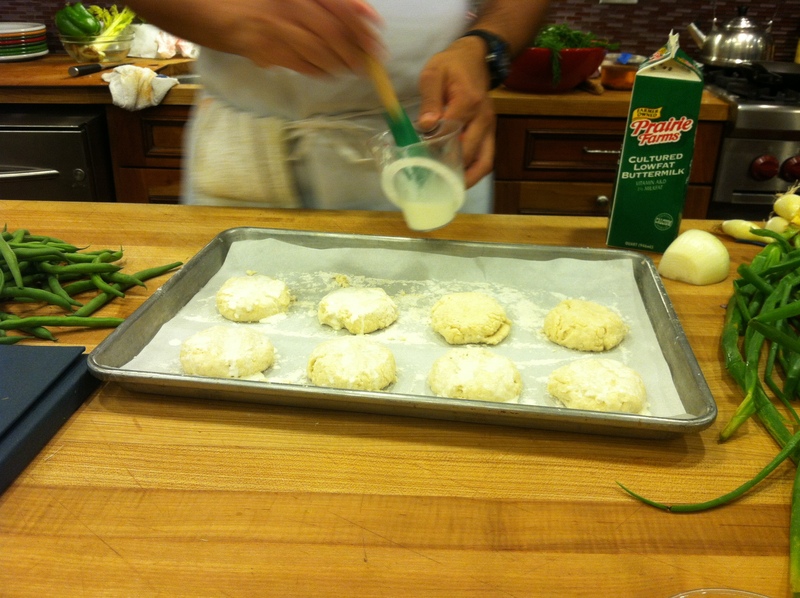 I started my weekend even earlier and came into the city on Thursday evening to take a cooking class at The Chopping Block, a recreational cooking school that I had been dying to try for a while. I found it while researching culinary school last winter. For a hot minute I thought culinary school might be my next step. Based on the course catalogs listed for different schools and programs I looked into I decided to pass because it was so similar to the curriculum I had in college. Not to mention I would be a in a WORLD of debt. I then started looking up cooking workshops and classes to just fine tune my skills and learn more. This is how I came across The Chopping Block’s class calendar. They offer classes every day of the week and each has a specific theme or skill, such as pasta or dessert classes to grilling or knife skills. Throughout the summer a Farmer’s Market Tour was listed for every Thursday. 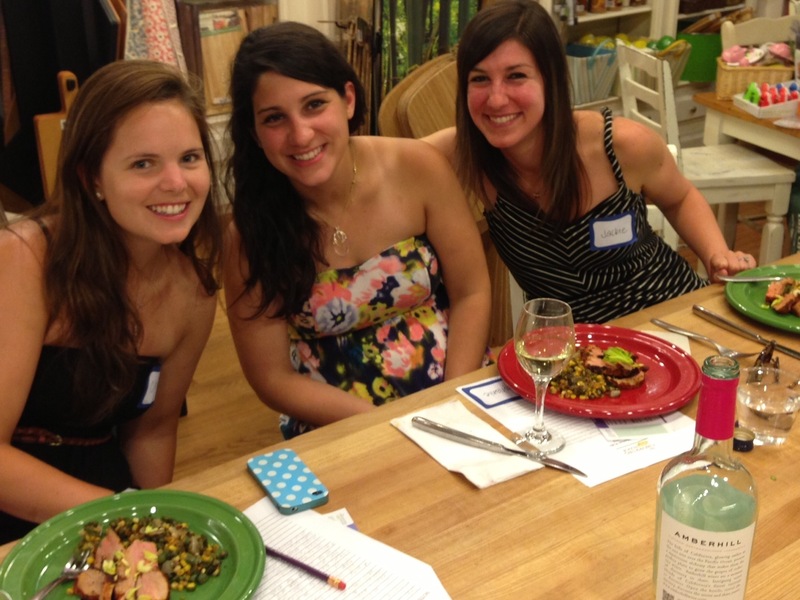 The description said the class would tour the Lincoln Square Farmer’s Market and purchase items to make an improvisational meal back at the classroom. It sounded right up my alley. My friend, Stephanie, even eagerly agreed to join me so we made plans to meet at the class. The class was a demonstration class versus a hands on course. (They offer both.) Despite this, I still learned A LOT. You will see this with my “take-away” notes. On Thursday, the traffic getting into Chicago was horrendous. Like, worse than it has ever been any time I have ever tried to get into the city. So, I arrived thirty minutes after the start of the class (even after giving myself an hour extra). As I was basically running to the class I was able to notice that Lincoln Square is awesome. It is a neighborhood that further north of the city than I had ever been in my visits to the city. There were plenty of cute coffee shops, restaurants and boutique-y shops. People, with their children and dogs, were out enjoying the night at the farmers market or listening to a couple bands playing on side streets. I really wished I had that hour I had planned for. This place looked like my kind of heaven. I need to go back. I got to The Chopping Block just as the class was getting back from the market. I was a tad disappointed, but looking at the produce the chef was pulling from their shopping bags I knew it would still be great. They found little golden plums, black raspberries, sweet corn, beets, gypsy peppers, knob onions, oyster mushrooms and carrots. The chef reached out to us for ideas for our meal based on the produce from the market and the pork tenderloin that would serve as our protein. The meal was started with a little “amuse-bouche” of baked polenta with caprese salsa. Take Away: Amuse-bouche translates to “Mouth Pleaser” and is a small plate before a meal, even an appetizer. You might see them in French restaurants. They are not ordered, but are offered by the chef without a charge to prepare the guest for the meal. 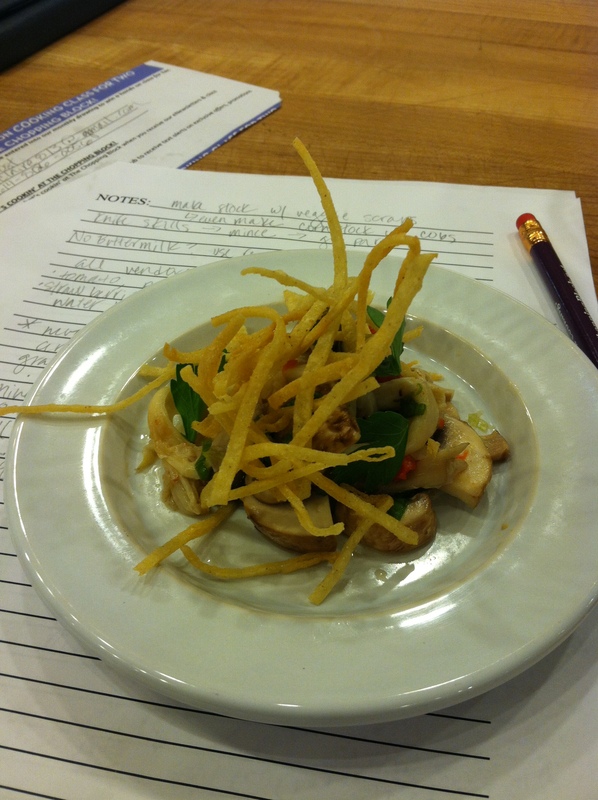 The class decided on ceviche for an appetizer using the mushrooms from the market. We topped the ceviche with fried tortilla strips for a little crunch. Take Away: Ceviche means to cook, or make soft, with acid. You can actually “cook” things, like shrimp, with citrus, to make a ceviche. The mushrooms were perfect. They had just the right amount of tang and the crunch of the tortillas worked great. Next it was onto the salad. We roasted the whole beets in the oven without any seasoning or marinade. Take Away: This helps to concentrate the flavor of the beet. They were seasoned once they had cooked. 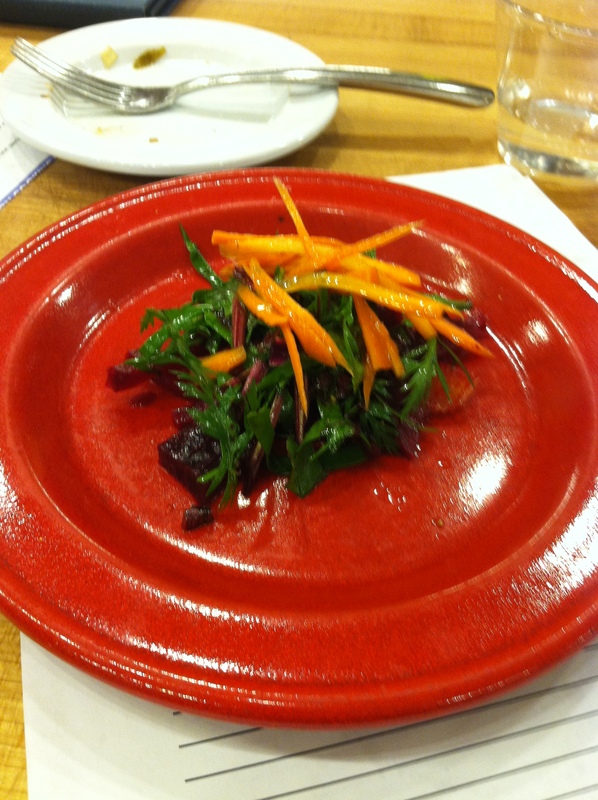 The cooked beets were topped with thinly julienned carrots as well as the greens from the carrots and beets. 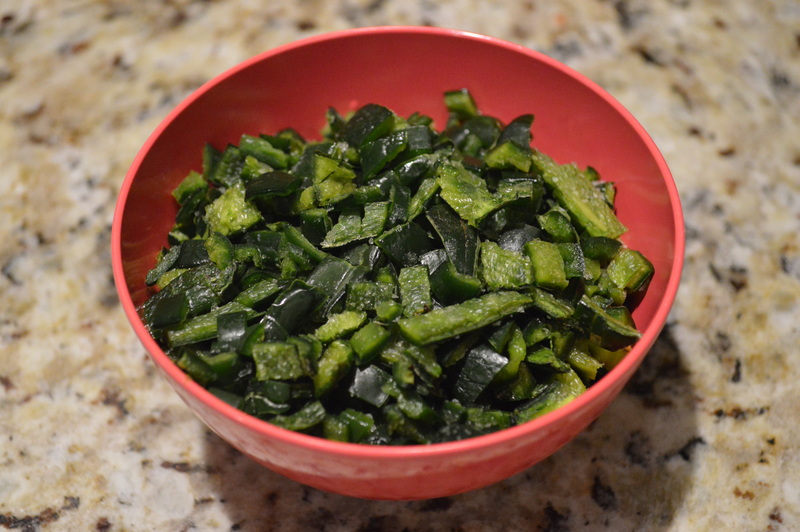 These greens are slightly bitter and full of nutrients. The colors in this salad were spectacular and all the flavors went well together. I need to try cooking beets at home sometime soon. 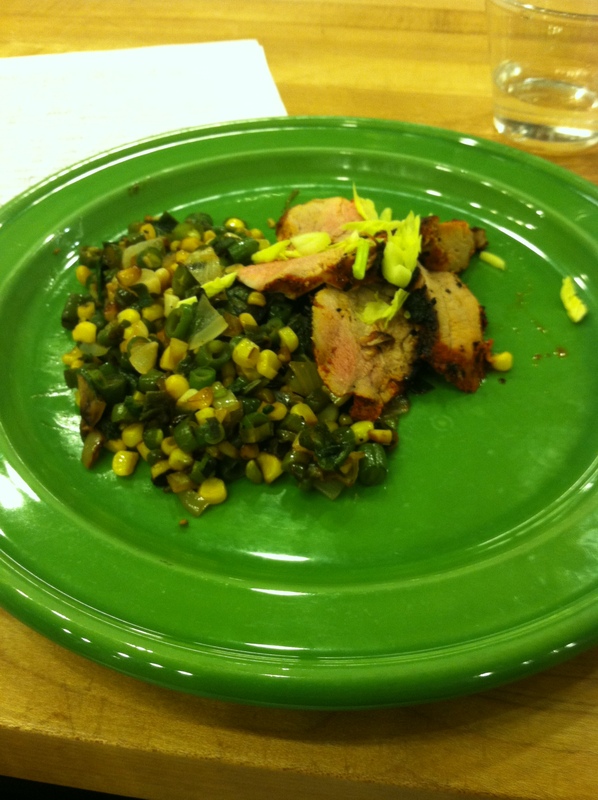 The main dish was made up of the pork tenderloin and a succotash made of the corn and onions. The pork was marinated in achiote paste, giving it a bit of a Mexican flare. Achiote paste can be found in Latin grocery stores and has an earthy, spice flavor. The succotash was made by caramelizing the onions and corn in a skillet on the stove top. Take away: Whenever I cook something in a skillet, I move the food items around with a spatula a lot. To get the veggies, like the corn and the onions for the succotash, to caramelize and to maximize their sweet flavors you should push the vegetables out in the skillet and leave them. Make sure the skillet is warm but won’t burn the vegetables. 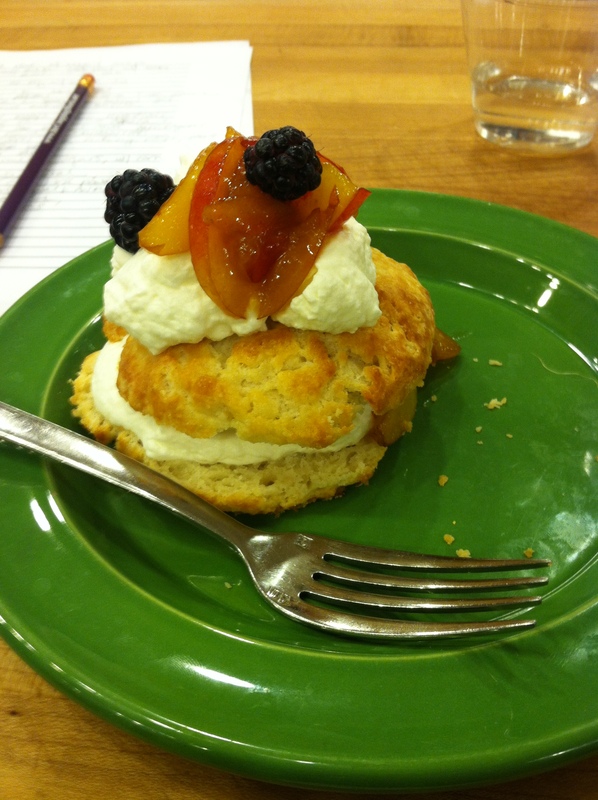 Finally, for dessert we had slightly sweet biscuits with whipped cream and macerated plums and berries. This was phenomenal. I am (weirdly…) not a huge fan of fruit, especially berries, but I finished and loved every bite. After everything was done, we were given the opportunity to shop around a bit. I picked up a bottle of grape seed oil after I learned that I might be giving Adam and me cancer… every day. Stephanie got some fun beer and cocktail items. As the other class participants were leaving, Steph and I got an opportunity to chat with the Chef and the Sous Chef a bit. I asked about the farmers market since I missed that part of the trip. He said that most of the produce in the market is from Illinois, but there are some vendors from Indiana. I also asked about their culinary education because it, in a way, inspired my trip. Both chefs never went to culinary school, but rather, worked in restaurants since they were young and picked up skills along the way. I had a blast the whole evening. I learned so much, had a fantastic meal and got to catch up over a bottle of wine with a great friend. With Stephanie and her sister, Jackie, before we dug into our local entrees. You can register for classes online. It’s a simple process and they charge you then. You cannot cancel once your class is less than a week out, but you can send a friend in your place. You can purchase wine or beer at the classes or you can bring your own bottles. They are subject to a corking fee. There are numerous “Boot Camps” that last up to five days. 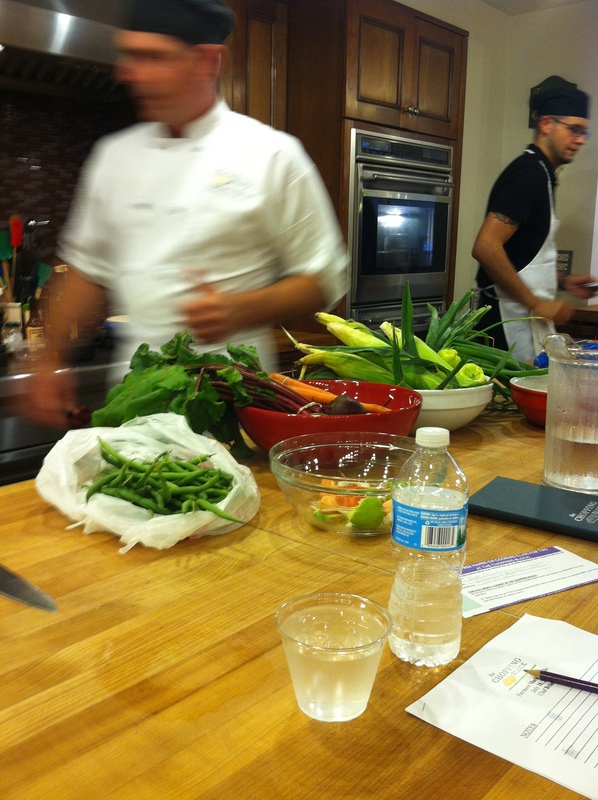 The topics for this cooking boot camps range from cooking basics to cupcakes or even sushi. Other classes last a few hours. If you are in Chicago but cannot make a class, you can shop in the retail stores at each location. They are great and full of fun cooking tools. It’s really worth checking out.